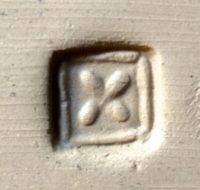 In order to make it easier to determine exactly who made a pot here at the W. M. Hewitt Pottery, and when it was made, we have listed below all the various stamps and markings that identify each pot made here. We hope this list will also be of interest to customers and collectors alike, and we encourage anyone with questions about individual stamps to get in contact with us. Mark typically has two apprentices working with him, each of whom usually works at the pottery for about two years. All pots made at the W. M. Hewitt Pottery are stamped by the individual potter who made them, and each potter is responsible for making and decorating their own work. For instance, when Mark makes a pot, he glazes and decorates that pot and stamps it with his own individual stamp, and the number of the firing. Likewise, when an apprentice makes a pot, the apprentice decorates and glazes that pot and stamps it with the generic stamp of the pottery, their own initials, and the number of the firing. For example, the Spring 2015 firing was the 92nd firing of the salt kiln and the pots are marked 92. After an apprentice leaves Pittsboro they may spend a few more years working or traveling before setting up their own potteries. Web site links and/or email addresses of each former and current apprentice are also listed in the table below if anyone would like to follow their progress. The numbering pattern continues with the number on the pot reflecting the number of the firing. are incised on the bottom of pots too.